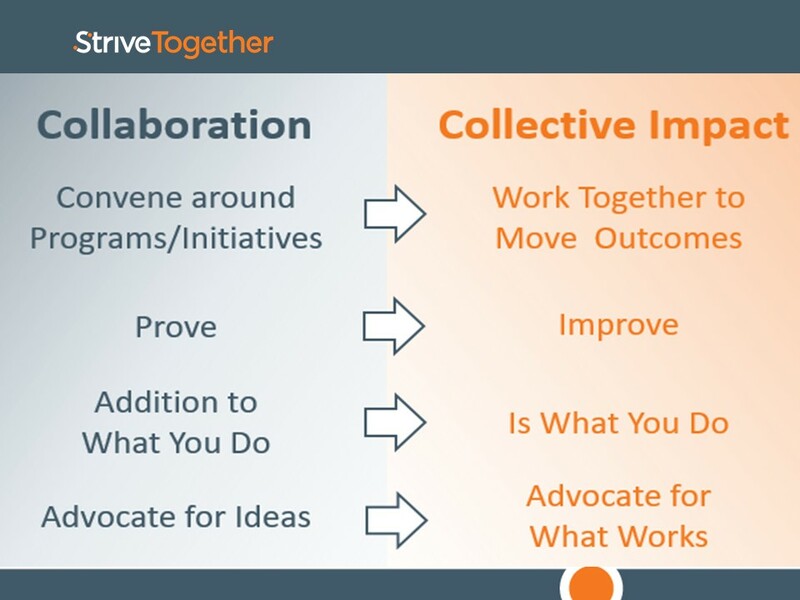 Based on these conversations, we have been able to identify the most critical differences between the historical definition of collaboration and the emerging understanding of collective impact. The diagram below outlines the differences as simply as possible. The first is that in collaboration, we have historically come together to implement a new program or initiative. This is most often the case when we wanted to apply for or have been awarded a grant. When it comes to collective impact, community leaders and practitioners come together around their desire to improve outcomes consistently over time. The outcome serves as the true north and the partners can uncover the right practices to move the outcome over time. This brings us to the second difference: using data to improve, not just prove. In collaboration, data is often used to pick a winner or prove something works. In collective impact, data is used for the purpose of continuous improvement. We certainly want to find what works, but the partners are focused instead on using the data to spread the practices across programs and systems, not simply scale an individual program. Third, collaboration is often one more thing you do on top of everything else. People meet in coffee shops or church basements to figure out how to do a specific task together and in addition to their day job. Collective impact becomes part of what you do every day. It is not one more thing because it is truly about using data on a daily basis — in an organization and across community partners — to integrate practices that get results into your everyday contribution to the field. And last, collaboration is often about falling in love with an idea. Somebody may have visited a program somewhere and seen something they liked so they advocated to bring it to town. The core assumption in their efforts is that success elsewhere will be consistent with success right here. Collective impact is about advocating what those practices you know get results in your own backyard. The voice of community partners is leveraged to protect and spread the best of what exists right here and now instead of what one hopes would get results down the line. It will be those communities that exemplify the rigor and realities of collective impact that can help us fully grasp the shift that needs to be made to achieve population level impact. We are on our way with the interest of so many and we are hopeful that we can collectively embrace this fundamentally new way of doing business.